It has been six months since we cast off the lines and started this adventure. The number one question we get asked is “is it everything you thought it would be?”. This is a difficult question to answer. The easy answer is “NO”. In some ways it is more and some less. We have met a ton of new and interesting people. Some are on a shoe string budget and some are more extravagant. We are probably on the more extravagant side. We miss our family and friends, especially the grand kids. We also miss our church and thought it would be easy to attend services along the way, it has not been especially when you walk everywhere. Blogging is very time consuming. The Admiral spends at least four hours and I spend an hour re-sizing pictures, uploading and formatting for each post. We do have our own data plan but we only have 5 gb/month. We do try to get free wifi when we can. I believe the Bahamas will be a challenge. We are enjoying our cruise. Everyday is a new adventure. 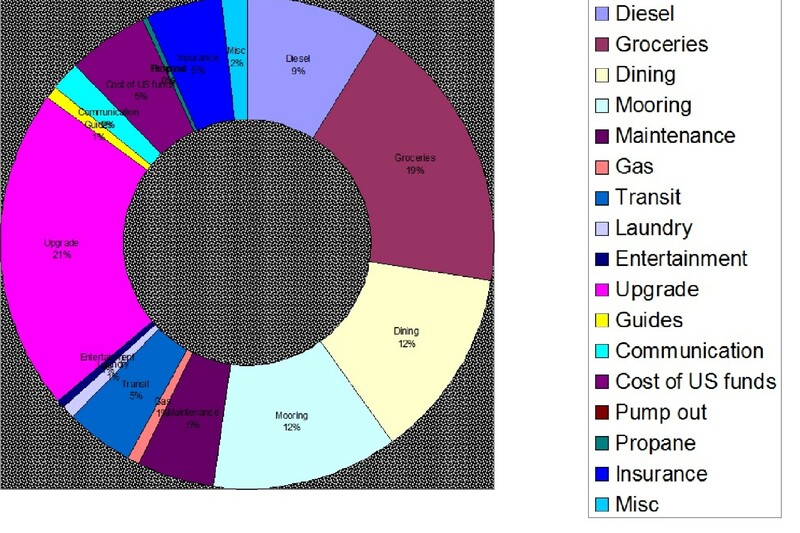 See the attached picture for a complete graph of our expenses.